Illinois insurance regulators recently released documents for filings accepted in March showing that almost two dozen insurers have already adjusted or are planning on adjusting car insurance rates in the state, with private policies seeing the largest increases. Drivers can cross-reference the new prices with auto insurance company ratings to find the carrier that works best for them. The documents made available by Illinois officials divide the premium changes up into liability and physical damage categories. The first includes required coverages like bodily injury and property damage liability, while the second comprises optional protections like comprehensive and collision that pay for damages to the policyholder’s own car, regardless of fault. The insurance price changes are on average and will fluctuate from customer to customer. Mercury filed the biggest overall rate increase with regulators in the state, announcing that, effective June 3 for renewing customers, the cost of liability policies for private passenger vehicles will increase 10 percent and property damage policies for those cars will increase 16.8 percent; the overall hike is 12.4 percent. Nationwide, which carries nearly the same amount of premiums as Mercury, will see smaller increases of 2.6 percent and 1.9 percent to its liability and property rates, respectively, that are effective Sept. 30. 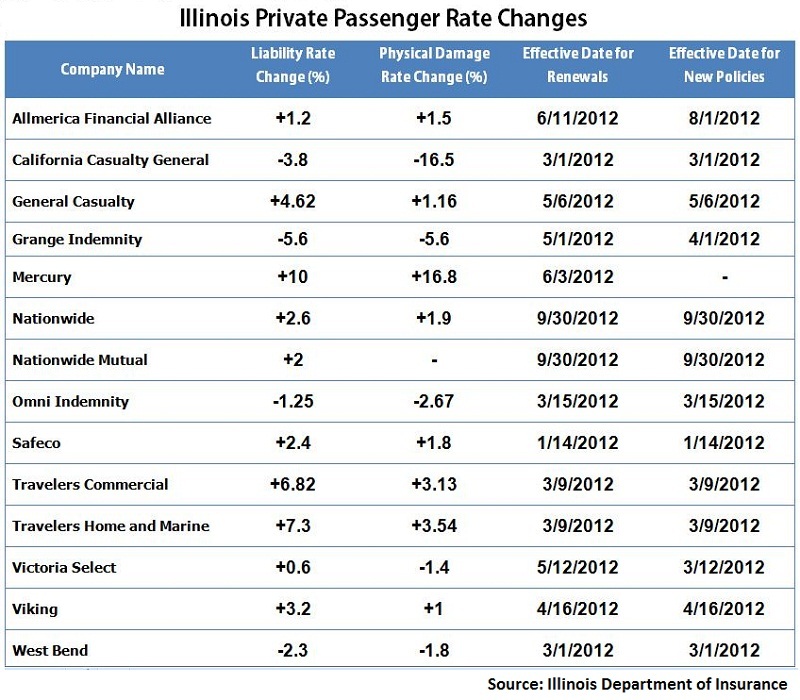 Travelers Home and Marine has the largest market share of all 23 companies announcing rate changes in Illinois, at $58 million for personal liability and $38 million to protect policyholders’ own vehicles. In March, the insurer hiked rates of liability by 7.3 percent and property by 3.54 percent. Travelers Commercial saw an overall increase of 5.31 percent, with a 6.82 percent liability hike and 3.13 percent property hike. Safeco, also a large writer of premiums, announced a 2.1 percent increase overall—2.4 percent to liability and 1.8 percent to property—that began in January as the company made changes to a handful of discounts for accident-free motorists, student drivers and paying accounts in full. Drops in rates were announced by relatively small companies like Grange Indemnity, which will drop its personal liability coverage by 5.6 percent and personal property coverage by 5.8 percent. Premium changes for new customers went into effect April 1 while the new pricing structure for renewal customers begins May 1. In March, Omni Indemnity decreased the prices of its liability and property coverage by 1.25 and 2.67 percent, respectively. West Bend Mutual’s rate drops of 2.3 percent for personal liability and 1.8 percent for personal property coverage went into effect in March. Some companies linked their hikes to specific products and programs, including Viking, which said its 3.2 percent and 1 percent increases for liability and property policies, respectively, are for the Dairyland Auto program that it underwrites. Also, Bristol West announced 4.4 percent and 3.7 percent hikes in personal liability and personal property, respectively, related to the introduction of its Select 3.0 Auto program. Bankers Standard is hiking commercial auto liability costs by 13.4 percent and commercial property damage premiums by 9 percent for new customers May 15 and renewal customers July 15. Auto Club Family and Auto Club Inter Exchange saw nominal changes to commercial property and no changes to commercial liability rates.